Distinguishing between products and inventions is central to understanding parent law. A product may be based upon one or more inventions. These inventions are often protected by patents. Just because two products are similar doesn't mean that they can't both be protected by one or more patents. For example, both Apple and Microsoft make operating systems. Both operating systems perform similar functions. However, both are protected by different patents that speak to the differences between the two inventions. Search for existing patents that are assigned to the corporation that makes the product you believe is similar to the one you wish to protect. Existing patents can be found by searching the database of the U.S. Patent and Trademark Office, also known as the PTO. Using a computer with internet access, go the PTO web site. Click on "Patents." A drop-down menu will appear. Select "Search for Patents." When the search screen appears, select "Advanced." You will see a number of different ways to search. Click on "Assignee." From here, you will be able to find all the patents associated with the product that you believe is similar. Determine which elements of your product are different from the ones disclosed in the patents that already exist. Many products are protected by dozens of parents. For example, the memory of a computer may be protected by many different patents that protect how the memory is organized, where it is found, and how it can be accessed. Distinguish which elements of your product are not disclosed in the patents held by the assignee of the product you believe is similar. These elements might be a patentable invention. Many online patent search firms can perform this step for you. Draft a patent application that discloses every aspect of how to make and use your invention. Using the services of a reputable online legal provider or attorney that specializes in patent prosecution can help you distinguish one invention from another. Patent prosecution refers to the process of submitting a patent application to the PTO and arguing that the application should be allowed. Draft the drawings that are included in your patent application. The PTO has extensive rules that govern patent drawings. Most drawings should be done in black ink, although the PTO does allow for photos and color under some circumstances, when color is necessary to understand the drawing. 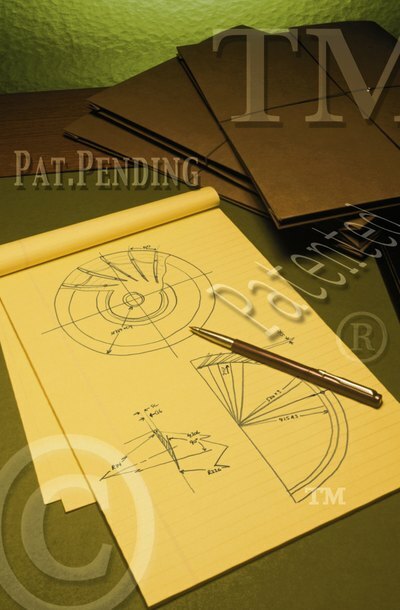 Many patent attorneys rely upon draftsmen that specialize in making patent drawings. You may wish to take advantage of an online service to perform this step. Draft claims that identify novel and non-obvious aspects of the invention. Just as real property is described using a special technical vocabulary, an invention is described by its claims. Claim language can be difficult to master because it describes the invention in very abstract terms. For example, a claim describing a light bulb could be "An apparatus for generating light consisting of a filament, a means for coupling the filament to a power source and a glass casement." You may wish to use an online legal service to draft your claims. Submit your application, drawings, and claims to the PTO. The PTO has a online filing service called EFS-Web. EFS-web can be accessed through the PTO's web site. You can submit Word documents, PDF files and other file types. The PTO also requires payment of a fee. This fee varies depending upon the number of claims, and whether you are a small business or a large one. Fees can be paid using a credit card or through an account set up in advance with the PTO. A trademark is phrase, symbol or design element that identifies the brand of a product or service. Unlike a copyright or patent, trademark protection takes effect as soon as the mark is first used in commerce, even without registration. Non-traditional trademarks include shapes, such as the trademark for the three-dimensional iPod shape granted to Apple by the U.S. Patent and Trademark Office in January 2012. The United States Patent and Trademark Office (USPTO) is the federal agency responsible for reviewing applications and determining whether to issue a patent. Since the underlying purpose of a patent is to protect the inventor's rights to a unique invention, similar inventions will not receive a second patent. As a result, it’s imperative that you search the USPTO patent database to find out if something has been patented prior to filling out an application.